Here you can buy the PDF download versions of several Calcudoku books (more to follow). This enables you to print as many copies of each puzzle as you like. You can submit solutions to the difficult puzzles in the books on the site and score points for each. then your "PDF download link" will be created automatically. 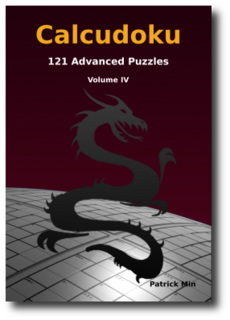 Finally a new volume in the Calcudoku Advanced series! Included are: puzzles using zero, negative numbers, modulo and exponentiation operators, puzzles without operators (called "no-op" or "mystery" Calcudoku), twin puzzles, and many extra large puzzles (from 10 x 10 up to 15 x 15, and even one 17 x 17!). 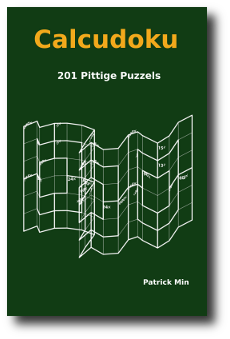 New in this volume: more puzzle variations and more puzzles with binary operators (including the new AND operator). Note that solutions to the puzzles worth points have not been included. Note: You have to be logged in to be able to buy the book. Originally created for a Malaysian university in 2012. An ideal book for beginning Calcudoku puzzlers, leading you gradually from easy starters to more and more complicated puzzles. Correct solutions to the final 20 puzzles in the book get you 8 points each on the site. Note: You have to be logged in to be able to buy the book. 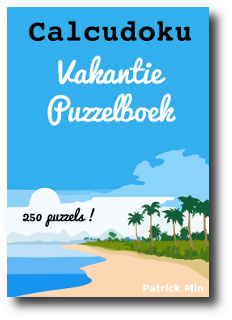 Almost Summer, so it's time for a Calcudoku Holiday puzzle book, with 250 puzzles of all types and sizes: puzzles with zero, twin puzzles, large puzzles (up to 12×12! ), and much more. 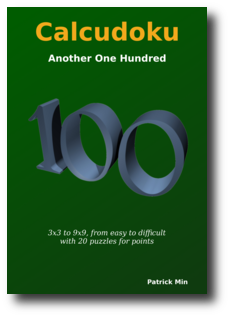 The difficulty level varies from easy (50 puzzles) via medium (150) to difficult (50) - so whether you're looking for a nice short puzzle, or hours of puzzling on a single puzzle, you'll find it all in this book. The book also has a description of the rules, explanations of the puzzle variations, and all solutions. Note: You have to be logged in to be able to buy the book. Originally published in 2011 and discontinued, but now revived as a PDF download. 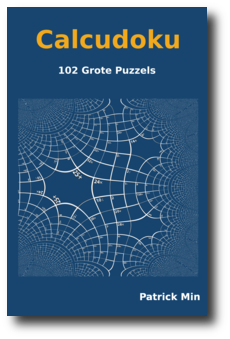 102 large puzzles (101 12×12 and one 15×15) in several variations: with zero, exponentiation, single operator, patterned, etc. 10 easy puzzles, 60 medium, and 32 difficult. Score 12 points on the site for each correct solution to a difficult puzzle. Note: You have to be logged in to be able to buy the book. Also from 2011 and unavailable for years, finally online as a PDF download. 201 'tricky' puzzles: 100 difficult 5x5 and 6x6 puzzles, and one 7x7, sorted in order of difficulty. Solutions for the final 41 puzzles can be submitted for points on the site. Note: You have to be logged in to be able to buy the book. to Patrick Min Computer Programming. Do put your username and the name of the book in the transfer comments.